Sewing Machine Motor – Ho Hsing Machinery Co., Ltd.
H. S. Machinery Co., Ltd. is a highly-qualified, Taiwan-based supplier and manufacturer of Regenerative Blowers, Side Channel Blowers, Rotary Vane Vacuum Pump, AC Servo Motor, Mini AC Servo Motor, EC Motor, Clutch Motor, Side Channel Ring Compressor, Suction Device, Venturi Device, Presser Foot Lifter, and Standing Operation Pedal. The supplier has been recognized as one of the most professional manufacturers in the industry since 1961. With both experience and innovation, the supplier is confident of providing buyers with quality Regenerative Blowers. The sewing machine motor offered by Ho Hsing, a supplier builds confidence in offering sewing machine and industrial sewing machine for many applications. We are a Taiwan based manufacturer of various motors for sewing equipment. We also serve vacuum equipment and other accessories equipment as well. This product is designed in one shot positioning, solenoid over current protector and also linkable to PC. Besides, the sewing machine motor can be drove by two way protection system, software and hardware. Moreover, the positioning is highly accurate, approximately in ±3.0 accuracy. The switching power supply system ranges from 160V ~ 280V.AC for different purposes. Since it can be linked to PC, the sewing machine motor is therefore parameters programmable, easy to adjustment and upgradeable. The EEPROM which is built in the motor can also manage and store the setting of the parameters. Another great thing of our equipment is its low noise, low vibration and low power consumption. This eco-friendly device is designed in multi-function to meet your needs. 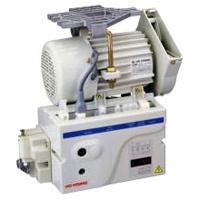 We provide quality motor for AC servo, mini servo, EC, induction, clutch and suction device. You can find your ideal one here, or get a customize one. We are honored to serve you the best. Please do not hesitate and contact us today for more info.